Alternanthera Reineckii “Lila” gets its name from the rich lavender color of its leaves. With good light levels, the new growth is tremendously dense and the leaves are close together. This flamboyant stem plant is also appropriate for the midground thanks to its extremely slow growth. However, it requires frequent pruning to prevent it from covering the background plants. A nutrient-rich soil and a decent CO2 supply ensure successful cultivation in the tank. 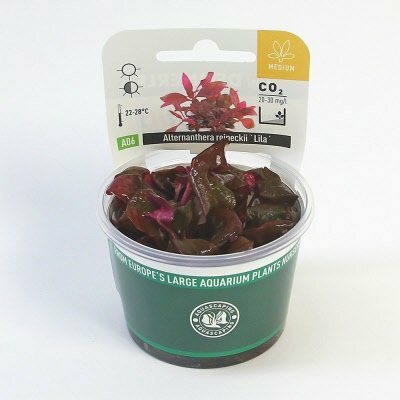 Red cultivars tend to die back when planted in a tank, but will recover in a week or two with good lighting and CO2 dosing.